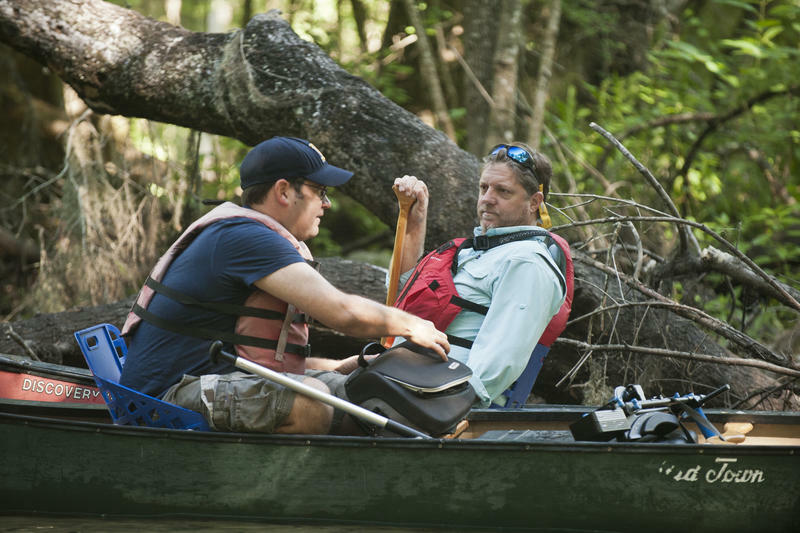 WUSF's Scott Finn and Tampa Bay Times outdoor editor Terry Tomalin explore the wild Upper Hillsborough River. A canopy of trees cover the upper Hillsborough River. Footbridge over the Hillsborough River. Alligators teem along the banks of the Hillsborough River. 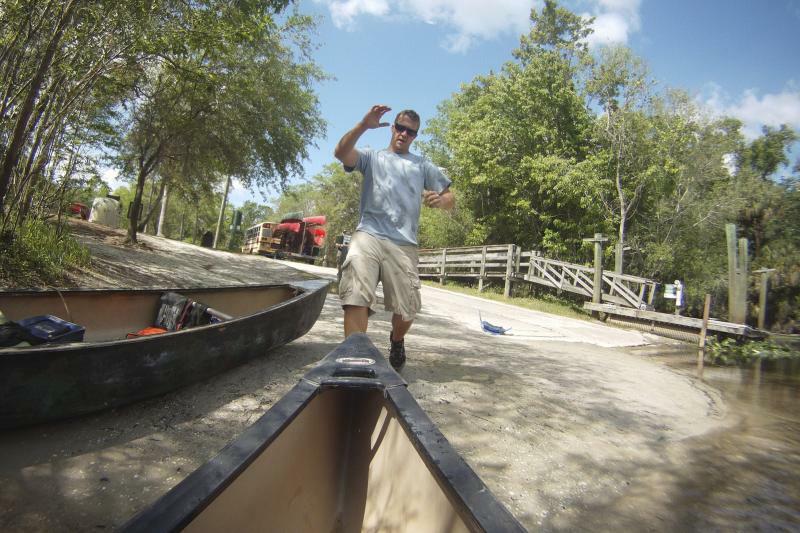 Joe Faulk, owner of Canoe Escape, preps everyone for the journey. One of the estimated 22,000 canoers and kayakers on the Hillsborough River each year. Just some of the minor rapids along the Hillsborough River. Canoes floating down the Hillsborough River early on a Sunday morning. The Morris Bridge was the first sign of humans we saw on almost five miles of the Hillsborough River. Canoe landing near Morris Bridge on Hillsborough River. Thousands of people cross it every day. It's where Tampa's drinking water comes from. But how much do you really know about the Hillsborough River? 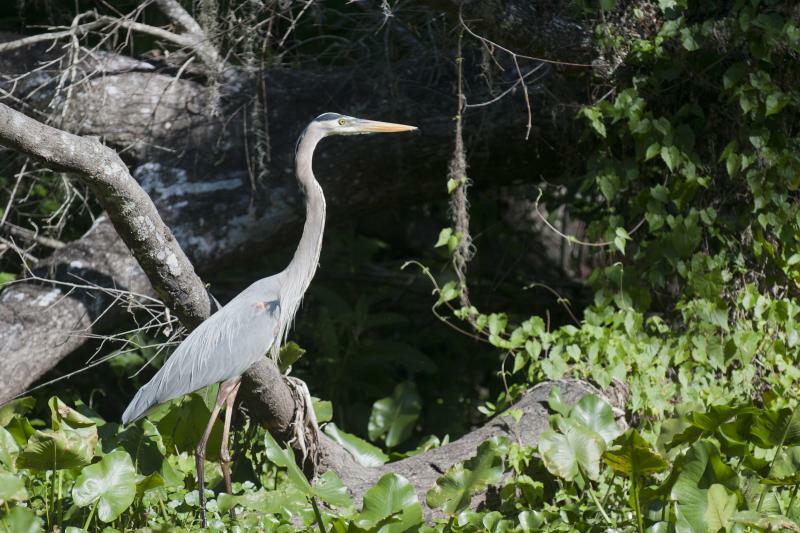 WUSF’s Steve Newborn and I teamed up with the journalism department at the University of South Florida St. Petersburg and Tampa Bay Times outdoors writer Terry Tomalin to tour the 59-mile waterway. We discovered a tale of TWO rivers. WUSF’s Steve Newborn explored the urban part of the river as it travels into Tampa Bay. But first, I took a trip down the pristine upper Hillsborough. 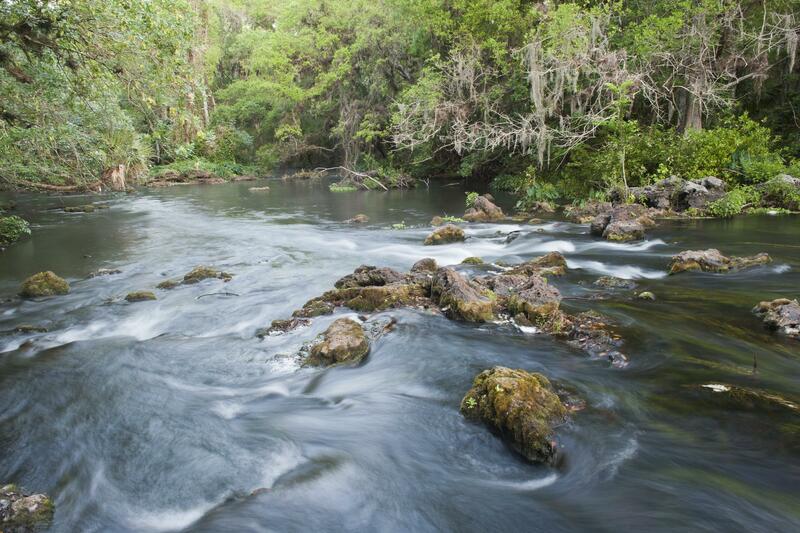 It’s just a few miles from Tampa, but it’s perhaps one of the wildest rivers left in Florida. 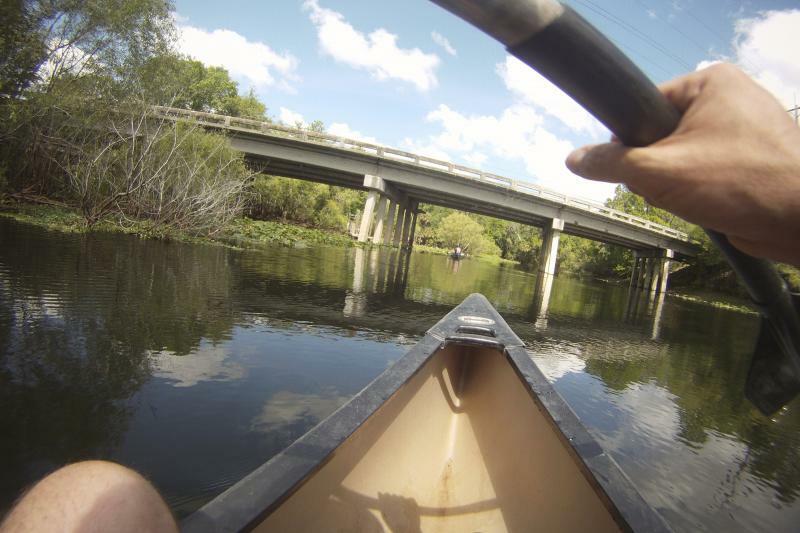 The only real way to explore the upper Hillsborough River is by kayak or canoe. That’s where I met Joe Faulk, owner of Canoe Escape. He helps 22,000 people a year explore the river – but unlike other Florida float trips, partying is not the purpose of these trips. 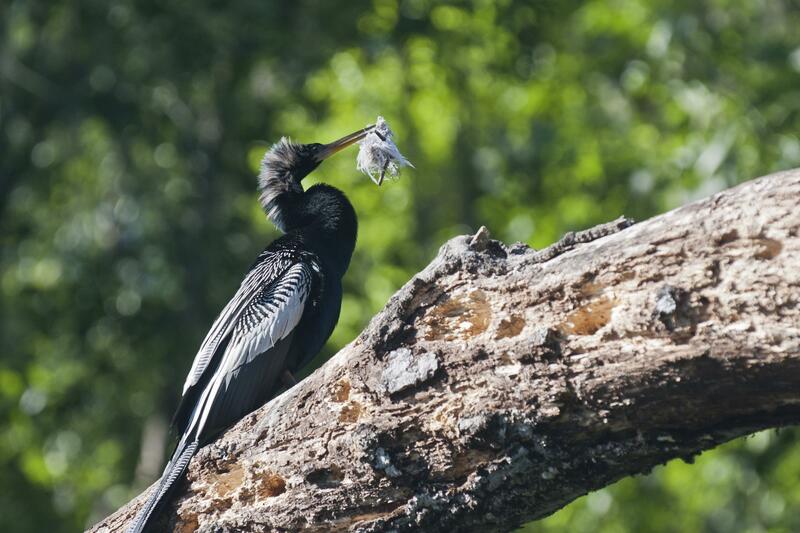 “Our customers come out to see nature and enjoy the wildlife…not be the wildlife,” Faulk said. 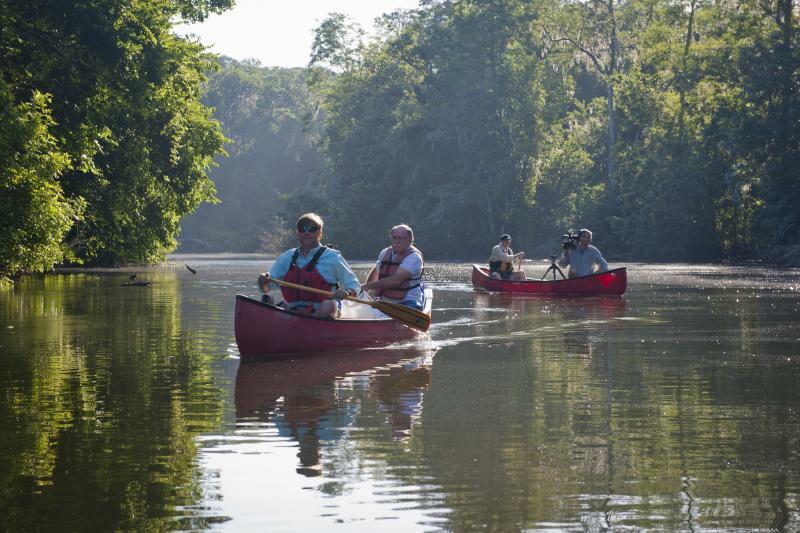 The area water management district, SWIFTMUD, protects about 23 miles of the river, with just a handful of canoe launches and fishermen’s trails. 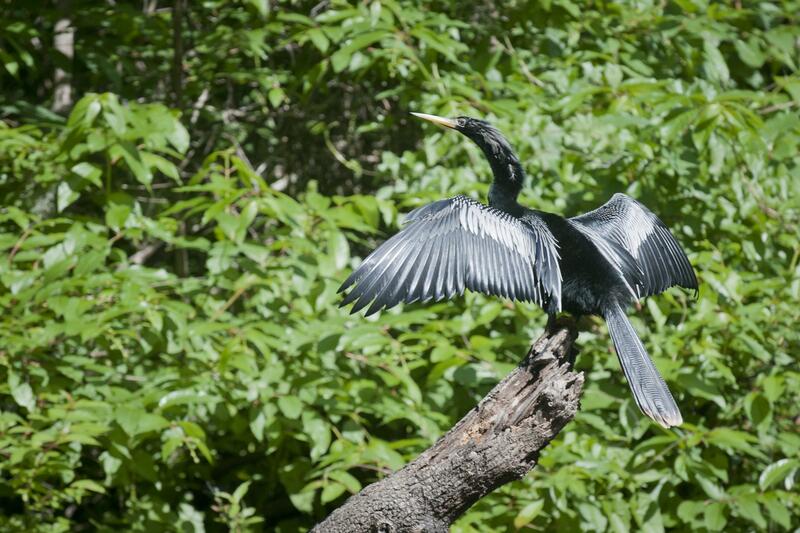 “This section is probably the best wildlife viewing of any river in the state of Florida,” Faulk bragged. He was right. On our canoe trip from Sergeant Park to Morris Bridge, I saw and heard so many large birds – egrets, owls, woodpeckers. There were too many turtles to count. We also saw lots of alligators – including a baby one. 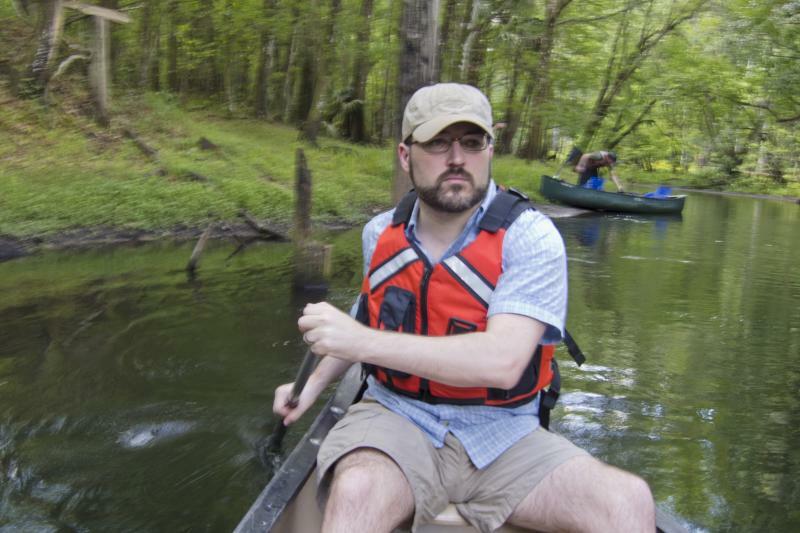 I was steering a canoe from the back while a videographer dangled a waterproof camera over the baby alligator’s head. He brought it lower, and lower, until BOP…he hit the baby on the nose. Baby alligator swam away, and from the bank I heard a loud, “PLOP.” Mama diving into the river! We slapped paddles to water and hightailed it out of there. We’re not the only ones who’ve had a close brush with nature. I met up with former Tampa City Councilwoman Linda Saul-Sena, on her fourth canoe with her sister from New York, Julie Saul. “This part of the river is so pristine, you expect to see a dinosaur peeking out of the trees,” Saul-Sena said. Julie Saul retold the story of a previous trip. She ran into a branch, saw a spider, and was so frightened she fell into the water. 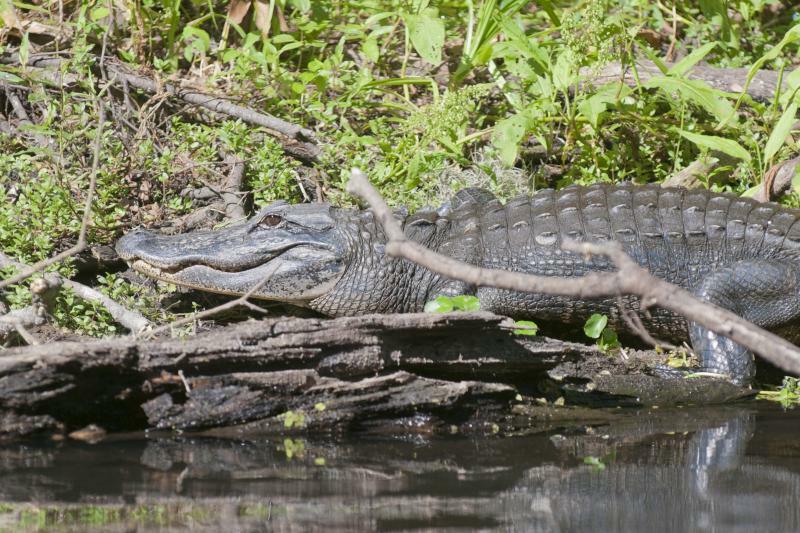 She lost her hat and camera – and briefly swam in a river teeming with alligators. It’s the same experience that keeps George Stovall coming back to the river. The St. Petersburg chiropractor has been paddling it for 45 years. He says he used to paddle from the springs that are the river’s source. That spring water is bottled now and they won’t let anyone in. There’s also the 17 Runs area of the river, just upstream from where we started, “which is a terribly difficult part of the river, very shallow, lots of deadfall,” he said. 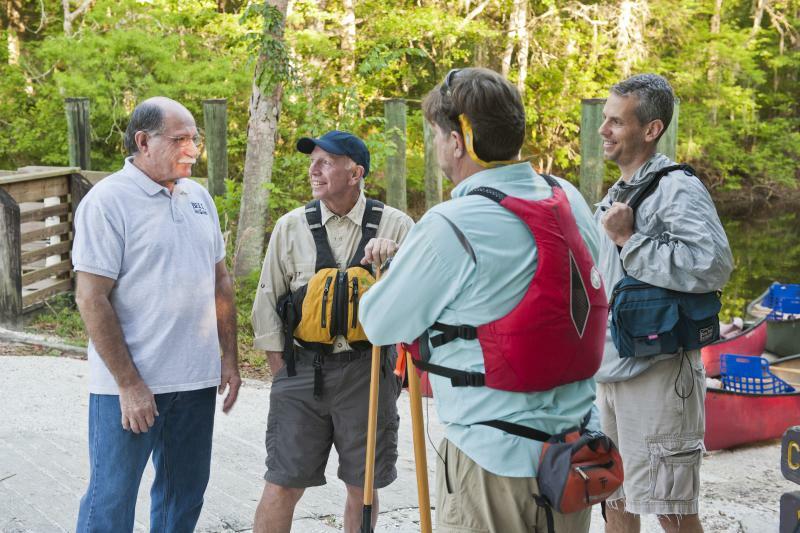 Stovall once paddled 17 Runs with Terry Tomalin, outdoors editor for the Tampa Bay Times. Both of them laugh as they tell the story of a videographer, who shall remain nameless, who lost his very expensive camera on the first rapid they hit. Tomalin says he loves that this river has remained essentially unchanged for thousands of years. He sees the same river as explorers and Indians did. “The Spanish conquistadors traveled up this river, the Seminoles fought here against federal troops in the 1840s, and then during the 30s, CCC guys worked in these swaps and built Hillsborough State Park,” he said. 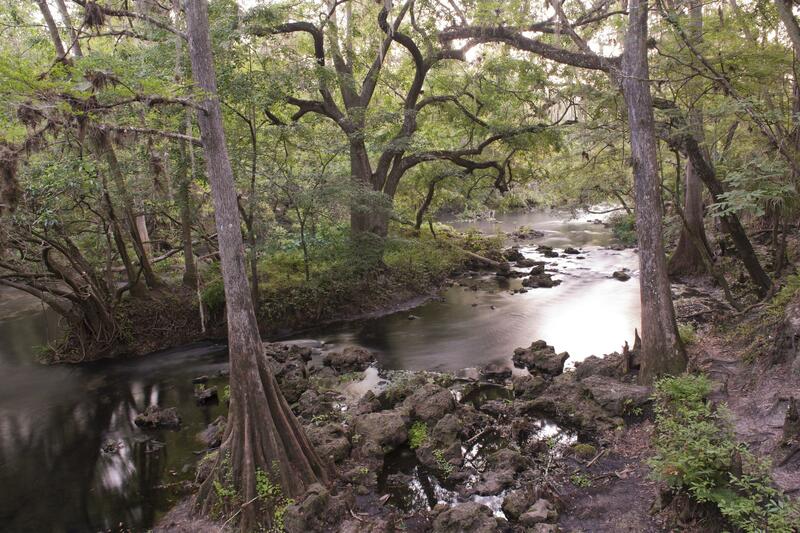 Tomalin says it’s perhaps the best examples of a true Florida river. You can see through its crystal-clear water to swimming turtles, schools of fish, even ripples in the sand from the current. 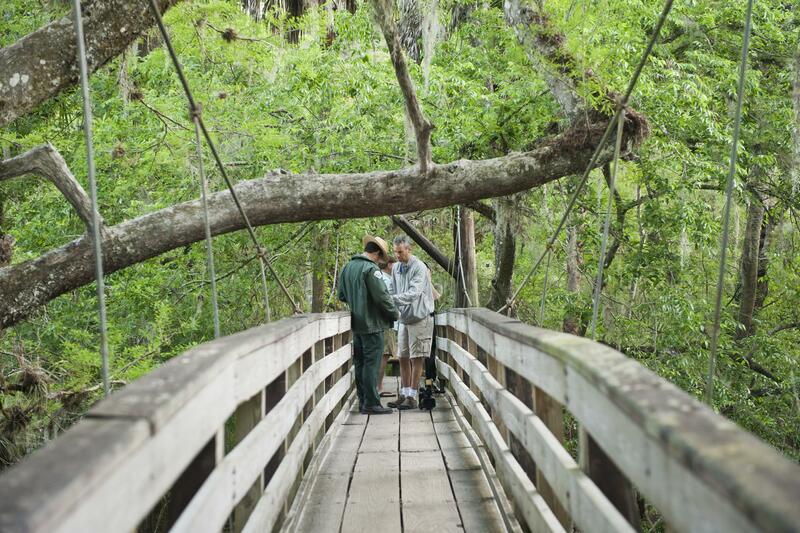 “And to think it’s just 12 miles from downtown Tampa…it’s just mind boggling,” he said. CLICK HERE to watch a video by Tomalin of our trip down the Hillsborough River.